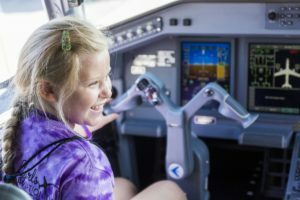 On Saturday, Sept. 23, SkyWest people celebrated Girls in Aviation Day at events held around the country. Girls in Aviation Day is held by Women in Aviation International (WAI) each September and looks to bring the passion, exploration, learning and excitement of aviation to girls aged 8-17. This year, SkyWest sponsored two WAI Girls in Aviation Day chapters: Purdue University and Stars of the North – Minnesota. It was a privilege to take part in the day’s activities and share our passion for aviation with future aviators! 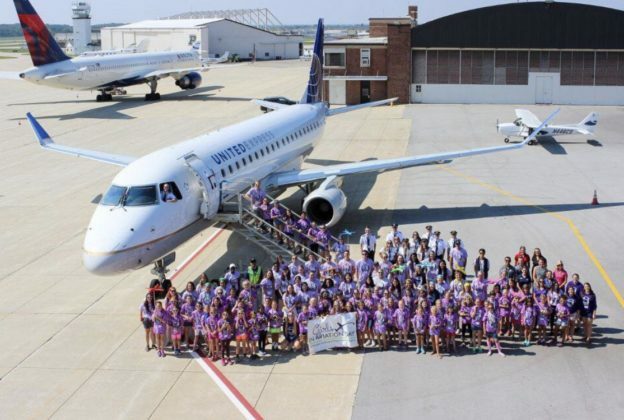 At the Purdue Girls in Aviation Day event, SkyWest pilots flew an Embraer E175 to the university airport, giving the girls up-close experience with state-of-the-art jet aircraft. Our pilots met with the girls and talked about their flying experiences as they showed off the aircraft, providing hands-on learning with everything from the controls in the flight deck to the massive engine underneath each wing for the awestruck group of girls. At the Girls in Aviation gathering in Minneapolis, Minnesota, the SkyWest team shared information about aviation STEM careers like airline pilots, mechanics and the variety of technical positions that keep an airline running! SkyWest is a proud equal opportunity employer and is home to more than 12,200 of the best professionals in the airline industry. Those who are ready to pursue their aviation career can apply online at www.skywest.com/careers.